JE Made Knives executes the Tribal Spear or Zulu pattern in his own iconically modern style. This knife has exceptional fit and finish, snappy walk and talk and delivers a modern traditional profile that is robust and ready for some serious use. This version comes with bolstered and diamond textured titanium handles, a stonewashed blade and 3D Machined Titanium Pocket Clip. Handle: The full titanium handles are clean and ergonomic with a subtle dual guard and contoured shape for comfort. The handles are milled with smooth integral bolsters with a classic diamond texture milling used in place of traditional covers. The whole handle is finished with a matte grey blast and tumble finish. The stainless steel back spring delivers a snappy action opening and closing and an inline pin is included for lanyard attachment. 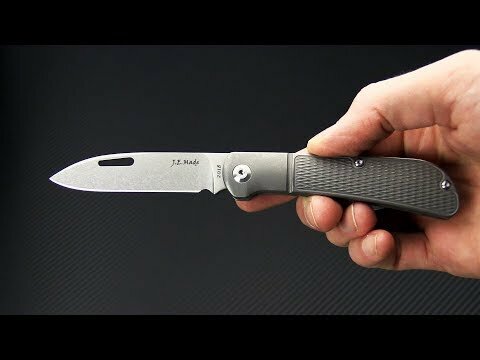 Carries via a right hand, tip-up only, 3D machined titanium pocket clip.